Halloween does not have to be just about candy and sugary treats! 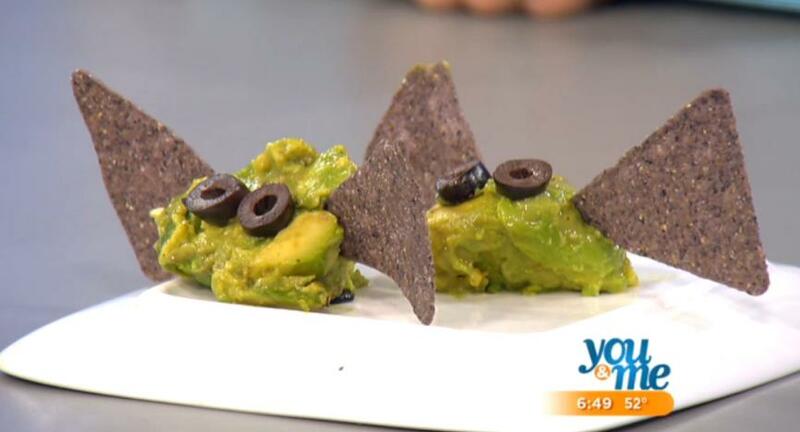 You can totally create creepy crawly healthy snacks without the added and empty calories. 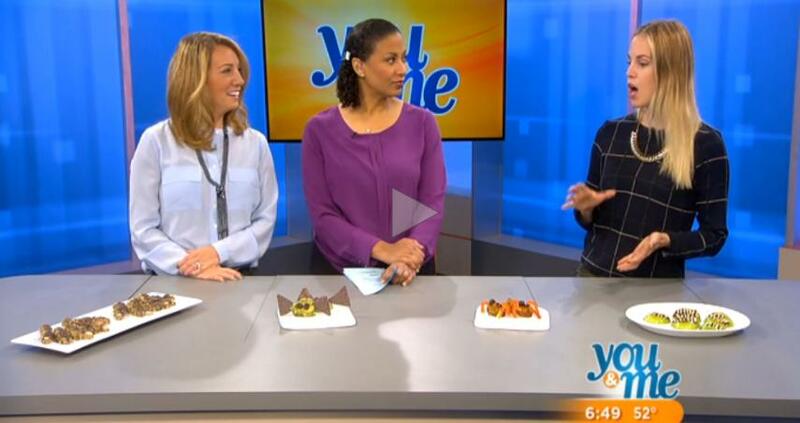 I stopped by WCIU You and Me This Morning to talk about some healthy plant based Halloween treats that you may or may not already know about. I rounded up two savory snacks and two desserts that can be quickly made for a spooky party or for your kids! Now as I stated in the video, these are not to be made to pass out to trick or treaters. You don’t want to be that creep-tastic individual who tries to hand out popcorn or apples..leave the candy for the kiddies trick-or-treat ritual, and balance their diet this weekend with these healthy alternatives. Once the mixture is blended and is sticking together, scoop out with a spoon a small portion of the mixture. If you make a circle with your index finger and thumb, that should be about the size of the scoop. At this point, you can mold the mixture to look like a finger by pinching two portions of it to look like knuckles, you can then take your fork and press down on the mixture to make the knuckle wrinkles. If you need help, look at your own fingers for inspiration. Sprinkle the cocoa powder on top to make the fingers look like they are covered in dirt. Cook the falafel. If you want to use a different spider body mixture, you can make spinach muffins, cheese balls, or anything that can be shaped into a sphere. Cut the red pepper into about 5 large strips, then cut the strips into thinner pieces starting at the base near the stem. Them cut the strips in half so that the bump in the red pepper is included in the strip – this is important so that the legs stay propped up and look realistic. Add the sliced black olives as the eyes – serve and enjoy! Directions: I like to think of this recipe more as an art project vs. a recipe that needs actual measurements. You have freedom to use as many or as little slivered almonds for the teeth as you can be creative. 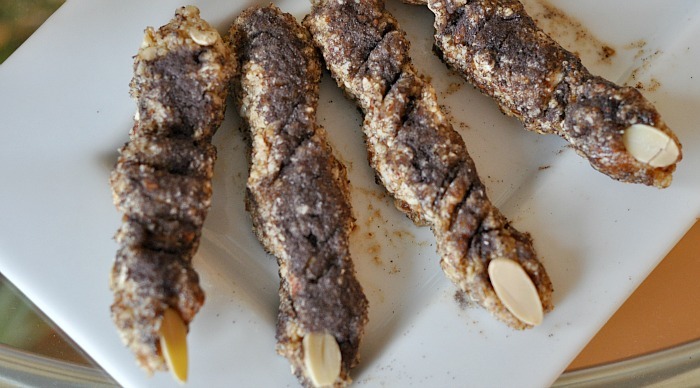 Carve out a mouth opening into the slices, if you accidentally cut the slice into two halves, that is OK.
Find and take different sizes of slivered almonds and place them as you wish around the perimeter of the carving so that they resemble teeth. Serve for your kids after school this Friday! 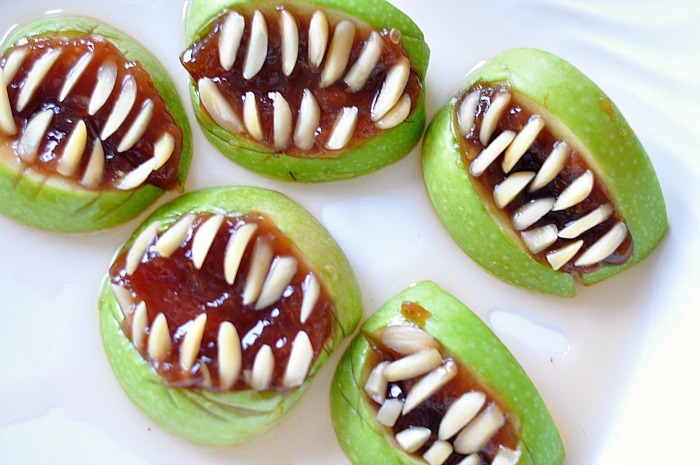 What type of healthy yet spooky treats are you going to make this year? Have a happy Halloween!